I was able to tour this new state of the art facility with my dad Bill Disque, and we were impressed by both the traditional layout found on the first floor that is filled with Lincoln artifacts and the second floor interactive display that opens after Lincoln’s assassination at Ford’s Theater. 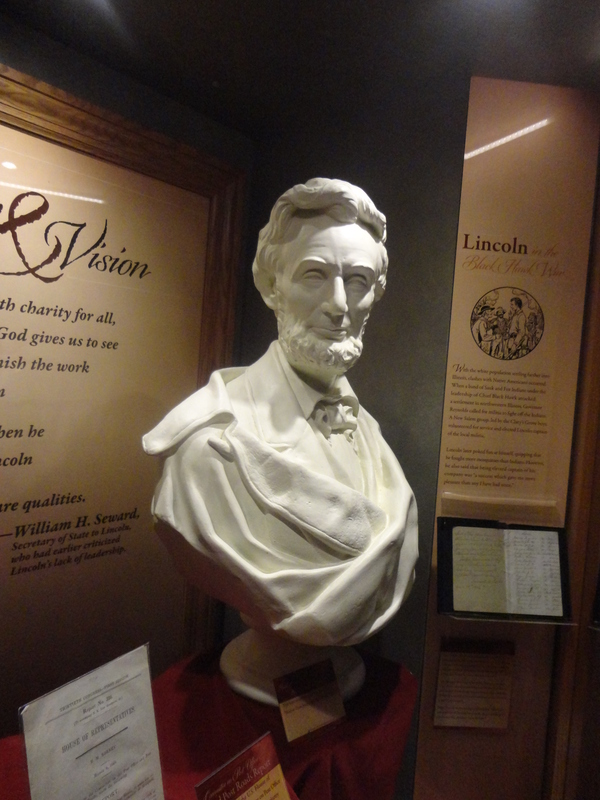 Ron Keller, Associate Professor of History and Political Science is also the Lincoln Heritage Museum Director shared that the museum focuses on Lincoln’s character. “Empathy, perseverance and intellect are all qualities Lincoln had, that we can all live out and immolate Lincoln doing,” Keller said. Taylor Studios out of Rantoul, Illinois was selected to work with Lincoln College on the museum designs. Using touch points, and pictures that first appear as silk screen paintings Taylor Studios brought Lincoln’s story together offering images with audio visuals. The museum first opened in 1942 when Judge Lawrence Stringer willed his Lincoln and Logan County history collection to Lincoln College with the stipulation that a museum be established. At first the museum was placed in “The Lincoln Room” that was dedicated February 11, 1944, and then the collection was moved to the McKinstry Memorial Building in 1971. The collection has grown with donations that include items from Robert Todd Lincoln Beckwith, the last surviving direct descendant of Abraham Lincoln. Today the collection has found a permanent home in the Lincoln Heritage Museum’s newly built Lincoln Center. The museum has several authentic Lincoln era items and one of my favorites was a platter that was sold while Lincoln was working as a store clerk in New Salem. Visitors to the museum can either take the quicker walk through without the audio visual effects, or if you have an hour and a half or more, (which I recommend if not with young children) the touch points provide all the details of Lincoln’s life after viewing the artifact and story boards on the first floor. “This is really something,” my father who is not lavish with praise said. When dad says something is worthwhile, they did a great job! Open Monday – Friday from 9 a.m. to 4 p.m. and Saturday from 1 p.m. to 4 p.m., the museum is closed Sundays and holidays. Admission is $5.00 for adults, $3.—ages 6-15 and senior citizens.